Refractory hypertension is a type of hypertension that requires special attention. Secondary causes of hypertension should be considered when uncontrolled blood pressure is present, especially in younger patients (<30 years). In this case, the presence of bilateral renal artery stenosis resulted in refractory hypertension and end-stage renal disease requiring renal replacement therapy in the form of hemodialysis. The main challenges will be discussed in this case is to deliver the most beneficial therapy considering the very limited option for revascularization therapy because of the late presentation of patient's condition. Intra-arterial heparin flushing was chosen for this patient to consider the advantages over the risks arising from the actions taken. The best approach for RAS is to salvage kidney function, control blood pressure, and further prevent other organ involvement caused by the complication of refractory hypertension by revascularization. Revascularization methods may vary from percutaneous transluminal renal angioplasty (PTRA) to surgery. The indication to vascularize patients with RAS includes significant RAS complicated by unexplained congestive heart failure or sudden, unexplained pulmonary edema, patients with significant RAS (70%) complicated by accelerated, resistant, or malignant hypertension, and in patients with global ischemia complicated by progressive kidney disease. However, if the stenosis is too severe, angioplasty, whether using stent or balloon angioplasty, may be difficult. Although surgery may be an option, sometimes the procedure is not preferred because of the high complications rate compared to PTRA approach. In this kind of condition, intra-arterial heparin flushing (IAHF) method may be used to salvage the unsalvageable stenosis. A 28-year-old Indonesian male was referred to the nephrologist for blood pressure evaluation and treatment. The patient was consistently suffering from blood pressure with systolic blood pressure ranging from 190 to 240 mmHg despite the use of five blood pressure medications (clonidine 3 × 0.15 mg, candesartan 2 × 16 mg, bisoprolol 1 × 5 mg, hytrin 1 × 2 mg, and nifedipine OROS 2 × 30 mg). The patient was diagnosed with end-stage renal disease with uncontrolled hypertension for 5 years and was undergoing hemodialysis as renal replacement therapy. On physical examination, patient was relatively stable with blood pressure 191/124 mmHg, and abdominal bruit was heard on auscultation. The awareness to re-evaluate the etiology of hypertension came from the symptoms of chronic headache with increasing severity for the last 2 months, which recently found in head magnetic resonance imaging (MRI) to be subdural hematoma. The patient underwent craniotomy to evacuate the hematoma and the headache subsided. However, the fact that stroke or other organ damage might worsen if the hypertension was not controlled was urgently driven the attending physician to look for further cause. MRI renal angiography showed stenotic in bilateral proximal renal artery [right: ±2.4 mm (normal: 5.68 ± 1.19 mm); left: ±2 mm (normal 5.68 ± 1.19 mm)]; indicating a secondary hypertension caused by bilateral RAS. 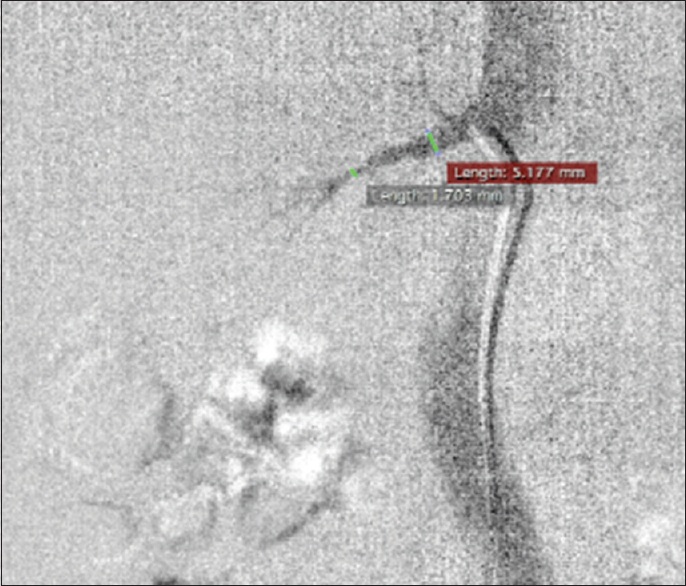 Then, the patient was prepared for digital subtraction angiography (DSA) to better visualize the stenosis. Both renal arteries were severely stenotic. It was shown that in left renal artery the ostium size was 3.94 mm with further decrease to 2.474 mm; the rest of the left renal artery was not visibly filled with contrast [Figure 1]. The size of the ostium of right renal artery was 5.177 mm with further decrease in to 1.703 mm; the rest of the right renal artery was also not visibly filled with contrast [Figure 2]. Due to the severe stenosis and blockage in both renal artery, stenting could not be done. Therefore, IAHF was preferred. The method was done by diluting 5000 IU heparin with 500 cc normal saline otsu (Otsuka, Lawang, Indonesia) to make the flushing solution; afterwards, the solution was flushed into the ostium of both renal artery. 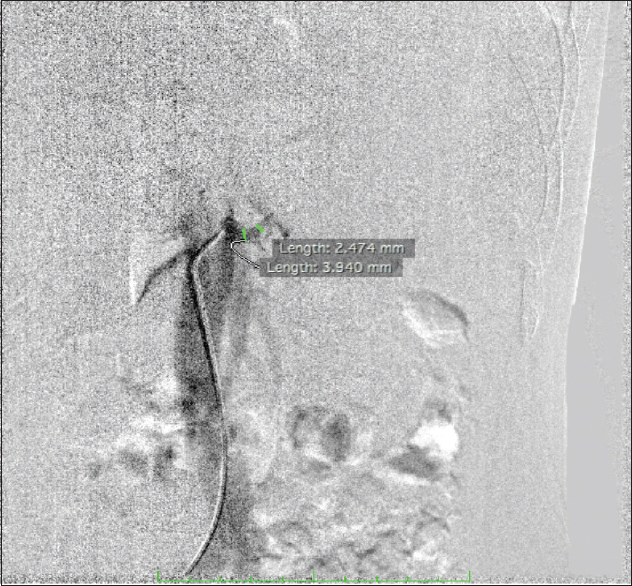 After IAHF solution was done, the stenosis of left renal artery was opened with ostium size 6.223 mm, which narrowed down to 4.101 mm [Left-Sided Image; [Figure 3]. Evidently, distal vessels are visibly filled with contrast compared to previous condition before intra-arterial flushing was done [Figure 1]. Although in the right renal artery, the ostium size was not much different from the condition before intra-arterial flushing (5.177 mm to 5.44 mm); although, compared to pre-flushed condition, contrast intensity was increased, and more distal arteries were opened evidently visible from the image showing proximal and distal renal arteries and from contrast injection [Right-Sided Image; [Figure 3]]. However, the image could not be compared perfectly because the angle was different in [Figure 2] and [Figure 3] (Right-Sided image). [Figure 3] (Right-Sided Image) was in oblique projection, whereas [Figure 2] was in anterior projection; explaining the difference in shape between the two images. The patient's blood pressure was monitored to determine whether the goal of the treatment, which was to control blood pressure, was achieved or not. From the follow-up, the patient's blood pressure was gradually declining and never again reached 200 mmHg [Table 1]. All of patient's medications, including hypertensive medicines, were still being consumed. The patient came back for further evaluation 3 months after the procedure. Office blood pressure was measured to be 160/80 mmHg, 164/77 mmHg, and 168/80 mmHg on one occasion. Meanwhile, the home blood pressure was 162/75 mmHg, 158/75 mmHg, and 160/82 mmHg. The patient had spiked hypertension reaching 180/77 mmHg, 182/75 mmHg, and 183/77 mmHg on one occasion after hemodialysis procedure. Further, the patient was asked to come and be evaluated at 5 months after the procedure. The office blood pressure was measured to be 158/76 mmHg, 160/67 mmHg, and 160/70 mmHg in one occasion. Meanwhile, the home blood pressure was 160/70 mmHg, 156/70 mmHg, and 150/60 mmHg. The patient had spiked hypertension reaching 178/75 mmHg, 172/65 mmHg, and 173/76 mmHg on one occasion after hemodialysis procedure. The secondary evaluation of hypertension was added, when the systolic reached more than 170 mmHg. Although the measurement of the hypertension was using digital sphygmomanometer, the result from using mercury sphygmomanometer did not show any difference: 176/84 mmHg, 178/74 mmHg, and 180/76 mmHg. In future, renal IAHF may be attempted again to achieve better result for this patient considering stent placement may not be possible. Hypertension is one of the major risk factors for cardiovascular disease. The prevalence of hypertension in developing countries reached 25.4% to 41.1% in males and 27.2% to 38.7% in women. Meanwhile, in developed countries, the prevalence reaches 20% to 30% with 51% to 80% getting treatment and only 27% to 66% of those who get their blood pressure controlled. The condition of hypertension that failed to be controlled by medication was finally termed as uncontrolled hypertension. In the routine treatment process for 5 years, the patient's blood pressure tends to increase and still not controlled by using antihypertensive therapy. The condition referred to as refractory hypertension, which, in this patient was caused by the late presentation of bilateral renal arteries stenosis. The goal of therapy in patients with RAS is normalization of blood pressure or increase control of blood pressure to reduce dependence on antihypertensive therapy, maintain kidney function and prevent renal replacement therapy, and reduce the risk of cardiovascular events and mortality. Revascularization is the treatment of choice for RAS, whether it was by percutaneous transluminal angioplasty (PTA) or by surgery. An indication for revascularization is if a stenosis of 50%–70% is established using guide wire 5F at a mean gradient of 10 mmHg; or more than 70% of stenosis was found using intravascular ultrasound. To maintain the lumen of renal artery patency, stent placement is required. However, in this case, the stenosis was too severe; therefore, stent placement procedure was not attempted. As an alternative, IAHF method was done. In any percutaneous angiography procedure, systemic heparinization is used to reduce the formation of thrombotic coating on the outer surface of the catheter, reducing clot formation in the catheter, and preventing thromboembolic complications. Meanwhile, IAHF can be considered a relatively new technique developed by Terawan et al., especially for relieving intracerebral artery stenosis. Terawan et al. from 2013–2014 had performed DSA procedures with the administration of a cerebral intra-arterial heparin bolus in 2,146 patients with ischemic stroke that resulted in 66% of patients experiencing an increase in cerebral blood flow as proven by comparing the MRI examination before and after procedure. While in 2015, Terawan et al. also performed DSA procedures with an intra-arterial heparin bolus in 75 ischemic stroke patients with an onset of more than 30 days that resulted in an increase in blood flow at the cerebral infarction area (P < 0.001) with an increase in average flow. Heparin has pleiotropic effects, including anti-inflammatory, anticoagulant, antithrombotic, profibrinolytic, antiaggregative, antiproliferative, antioxidant, and anti-ischemic properties. The effect of heparin's antioxidant involves myeloperoxidase (MPO), an enzyme produced by leukocytes, which has mechanical effect on the process of chronic inflammation in blood vessels. In atherosclerotic lesions, MPO acts as a mediator of lipoprotein oxidation, catalyzing the nitration process in tyrosine residues, reducing the amount of nitric oxide (NO) by using it as a substrate in free radical formation. Heparin is also shown to release the MPO bond with the endothelium so that heparin is able to increase the bioavailability of NO. Besides the effects of heparin mentioned above, heparin also has vasodilation properties. The mechanism involved is because heparin increases the bioavailability of NO present in endothelial cells and is thought to be associated with the release of local histamine. Other studies stated that unfractionated heparin vasodilatory effect was also caused by concentration-dependent vasodilation using endothelium-dependent mechanism through the secretion of NO and endothelium-derived hyperpolarizing factor. The clinical bottom line is that IAHF can be considered as one of the methods for RAS in cases where ballooning or stent placement are not possible. Considering its vasodilatory effect, IAHF may be considered as a bridging procedure before stent placement. Besides, the possibility of applying the procedure in any kind of angioplasty procedure and comparing it head to head to stent placement, ballooning, intra-arterial thrombolytic, and even to surgery is still wide open to be studied. Renal artery stenosis: Practice essentials, pathophysiology, etiology. Available from: https://emedicine.medscape.com/article/245023-overview. [Last accessed on 2018 May 24]. Vagaonescu TD, Dangas G. Renal artery stenosis: Diagnosis and management. J ClinHypertens 2002;4:363-70. Alhadad A, Ahle M, Ivancev K, Gottsäter A, Lindblad B. Percutaneous transluminalrenal angioplasty (PTRA) and surgical revascularization in renovasculardisease—A retrospective comparison of results, complications, and mortality. Eur J VascEndovascSurg 2004;27:151-6. Foy A, Ruggiero NJ 2nd, Filippone EJ. Revascularization in renal artery stenosis. Cardiol Rev 2012;20:189-93. Michaels AD, Chatterjee K. Angioplasty versus bypass surgery for coronary artery disease. Circulation 2002;106:e187-90. Putranto TA, Yusuf I, Murtala B, Wijaya A. Intra arterialheparin flushing increases cerebral blood flow in chronic ischemic stroke patients. Indones Biomed J 2016;8:119. Ibrahim MM, Damasceno A. Hypertension in developing countries. Lancet 2012;380:611-9. Sheppard JP, Martin U, McManus RJ. Diagnosis and management of resistant hypertension. Heart. 2017;103:1295-302. Medscape: Medscape access. Available from: https://www.medscape.com/viewarticle/751488_5. [Last accessed on 2018 May 27]. Medscape: Medscape access. Available from: https://www.medscape.com/viewarticle/751488_9. [Last accessed on 2018 May 27]. Alamri HS, Almoghairi AM, Alghamdi AA, Almasood AS, Alotaiby MA, Kazim HM, et al. Efficacy of a single dose intravenous heparin in reducing sheath-thrombus formation during diagnostic angiography: A randomized controlled trial. J Saudi Heart Assoc 2012;24:3. Putranto AT, Ratmono T, Hidayat A, Putera B, Widodo J, Hermiwati L, et al. Intra-arterial heparin flushing improve cerebral blood perfusion in ischemic stroke patients: A report from cerebrovascular center indonesia army central hospital gatot soebroto (rspad). Korean J Intern Med 2014;29. Available from: http://www.ekjm.org/upload/42849868.pdf. [Last accessed on 2018 May 27]. Hirsh J, Anand SS, Halperin JL, Fuster V. Mechanism of action and pharmacology of unfractionated heparin. ArteriosclerThrombVascBiol 2001;21:1094-6. Rudolph V, Heitzer T, Roiss M, Rudolph T, Meinertz T, Baldus S. Heparins increase endothelial nitric oxide bioavailability by liberating vessel-immobilized myeloperoxidase. ThoracCardiovascSurg 2007;55.doi: 10.1055/s-2007-967424. Tasatargil A, Golbasi I, Sadan G, Karasu E. Unfractionated heparin produces vasodilatoryaction on human internal mammary artery by endothelium-dependent mechanisms. J CardiovascPharmacol 2005;45:114-9.